Wasn’t life supposed to slow down a little bit after school started?? THAT certainly hasn’t happened in my life! How about yours?! We have been busier than one armed wallpaper hangers here at the shop, thanks to our wonderful customers! Speaking of them, we would like to congratulate Marcia Scott, who is the winner of our first monthly drawing for a $25 gift certificate, and to Lisa Shawler, who won a $50 gift certificate through our Facebook contest! Ladies, your certificates are in the mail! Our next monthly drawing will be October 2, at 10:00 am. Remember, you put your name in the jar with each purchase made! So, come in often, and purchase often! Remember that episode of The Brady Bunch in which Jan confesses to her parents that she is tired of being in Marsha’s shadow. All she hears is, “Marsha, Marsha, Marsha!” Well, with this next bi-weekly sale, all our other fabric lines are probably wailing, “Moda, Moda, Moda! That’s all we hear!” Poor guys! They are feeling left out! See the details below! 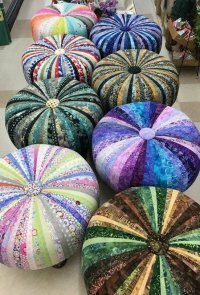 Read further for some exciting new classes on the books: Jelly Roll Rug and Tuffet Class. And, of course, our Tucker University is coming up on September 22nd! And, don’t miss out on this month’s mini-retreat, September 27-30 in our classroom. 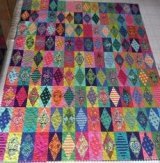 Today is the Last Day.... All of our Peppered Cottons and Free Spirit fabric (Tula Pink, Kaffe Fassett) on the bolt is 20% OFF!! Also, our pre-cut Free Spirit Fat Quarters are buy 4 at regular price ($3.50), get one free!! BI-WEEKLY SALE—September 8—September 21st only—All things MODA (yardage, precuts, and kits) are 20% OFF!! This is all MODA throughout the store!! It is EPIC!! HOT DEAL #3— September 8—September 21st only—while supplies last! Select Patterns are BOGO! Denise will have a selection of patterns that are Buy One, Get One Free! Stock up now to plan your projects for next year! FREE PATTERN #3—Easy Panel Quilt—Whip one up in no time! It is easily adapted to fit panels of any size! 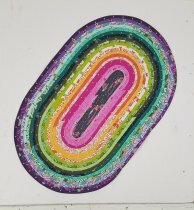 Denise Shivers will walk you through the construction of a lovely throw rug made with just one jelly roll! She has all sorts of tips and tricks to share with you to make your rug turn out great! Class fee is $25, but if you purchase the precut batting here, you will only pay $15 for the class! Justine Burris will teach you to make those tough elongated diamond units needed for any Storm at Sea project with ease and success using the Diamond Rects Ruler from Studio 180. 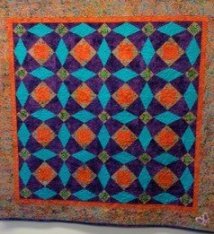 This elongated diamond unit is a basic unit that can combine with any of the other fundamental units to create many, many other interesting designs and quilt projects. You’ll precision cut the center diamond, then sew on side triangles to created an oversized unit that you’ll trim down to the perfect size. Audra Langley will walk you through the construction of this amazing, which you will customize using the jelly roll of your choice. Kits required for this class will be available for purchase when you sign up for this class. Class size limited to 10, so sign up early. You must pay the class fee to reserve your spot in the class. We will be offering a mini-retreat each month from now until December, on a Friday-Sunday! We will meet at 10 am and sew until whenever. You will not believe how much you can get done! Come and join us for one day or for all three. Friday will be a brown bag lunch, and pot luck on the weekend! YOU MUST CALL THE SHOP TO RESERVE A SPOT. It is in our classroom, so space is limited. It’s hot out there—come inside and sew!!! There is no fee for this retreat. Watch newsletters and Facebook for our fall dates.